Prospect.1 and Loyola University New Orleans have teamed up to offer an exciting collection of exhibits throughout the main campus beginning Nov. 1. Loyola will be one of many hosts around the city to house artwork from the national traveling collection. Prospect.1 is the largest biennial of international contemporary art ever organized in the United States. It is directed by international curator Dan Cameron, director of visual arts at the Contemporary Arts Center in New Orleans, and produced by U.S. Biennial, Inc. Conceived in the tradition of the great international biennials, such as the Venice Biennale and Sao Paolo Biennial, Prospect.1 will showcase new artistic practices, as well as an array of programs that will benefit the local community. Over the course of its three-month run, the biennial will draw attention, creative energy, and economic activity to the City of New Orleans, a historic regional artistic center, and the struggling Gulf Region. Loyola will display a Prospect.1 traveling piece and several separate satellite exhibitions running concurrently with Prospect.1. 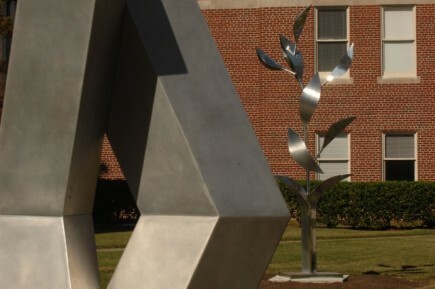 Loyola will also feature a newly installed sculpture garden located between Marquette and Bobet Halls. Among the exhibited artwork will be an "Emergency Response Studio" project, a traveling exhibit part of Prospect.1 by Paul Villinski; The Loyola Sculpture Garden; "Recursion," a Loyola alumni exhibition; "Renewal – New Morning," exhibit by Wayne Amedee; and "Yellow Cake," a sculpture by William "Mark" Grote. "Emergency Response Studio" is a mobile artist’s studio designed to enable visual artists to embed in post-disaster settings, respond and contribute creatively. Built from a salvaged FEMA-type travel trailer, it is entirely powered by a 1.6 kilowatt solar system and a micro-wind turbine. Sustainable and green materials, including recycled denim insulation, zero-VOC paints and reclaimed wood and floor tiles made from linseed oil, minimize the structure’s carbon footprint and enhance quality of life for its inhabitants. The project is conceived as symbol of transformation and possibility for the communities of the Gulf Coast. The Loyola sculpture garden is an exciting addition to Loyola’s main campus. The first sculpture for the garden, "Tapatawpa," by David Borgerding, was installed last spring. In November, five additional sculptures by artists Jesús Moroles, John Scott, Lin Emery, Martin Payton, Wayne Amedee and Arthur Silverman will be added. "Recursion" is an exhibit that features the works of five Loyola visual arts alumni who have returned to the university to create new installations and performance work around campus. The artists participating are Butch Merigoni, Analia Saban, Anne Yalon, Brett Reif and Steve Quick. Amedee’s "Renewal – New Morning" exhibition will feature several works with the dual themes of renewal and recovery. "These works start out with the renewal theme of psychological self-healing utilizing the sea as a metaphor for its calming sense of self help. The theme new morning continues as a segue from renewal for a sense of a totally new day as experienced, once again, in nature. These two metaphors of nature are the theme of the works in an effort to continue in a post-Katrina world, to not only rebuild ourselves psychologically but to start over again," Amedee said. "Renewal – New Morning" will be on display in the Collins C. Diboll Art Gallery, located on the fourth floor of the Monroe Library until Nov. 20. "Yellow Cake" is based on four major nuclear events: the nuclear explosion that occurred at the Alamogordo test site in New Mexico in 1945; the atomic bombs dropped on Hiroshima and Nagasaki, Japan, in August 1945; the Cuban Missile Crisis that took place in October 1962; and the United States invasion of Iraq in 2003. For more information about these events, contact Sean Snyder in Loyola’s Office of Public Affairs at smsnyder@loyno.edu or (504) 861-5882.